Iraq celebrates victory over ISIS in Mosul. 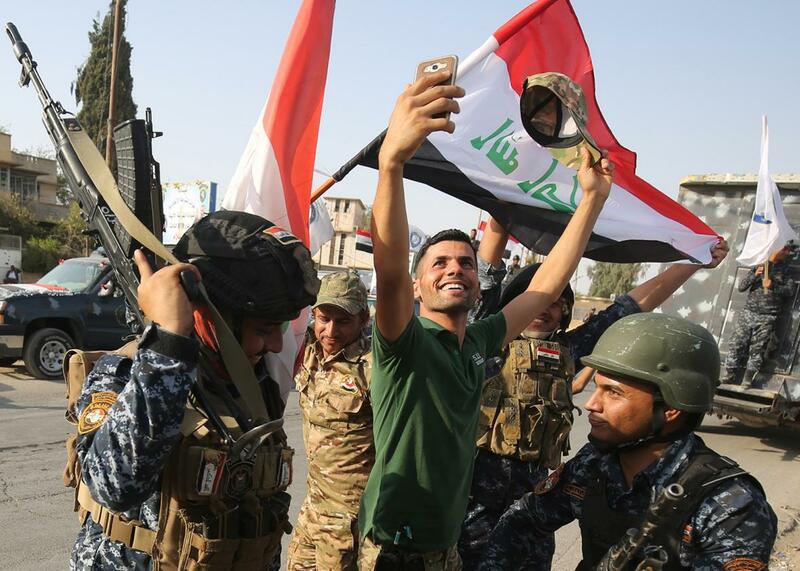 An Iraqi man takes a selfie with federal police as they celebrate in the Old City of Mosul on Sunday after the government announced the “liberation” of the embattled city. The Iraqi government celebrated Sunday as it declared that the country’s armed forces had defeated ISIS in the militants’ former stronghold of Mosul after a nine-month campaign. Although heavy fighting continued in certain parts of the city, Prime Minister Haider al-Abadi traveled to Mosul to congratulate Iraqi troops for the victory. He posted a message on Twitter showing a photograph of himself shaking hands with an Iraqi military officer. “PM Al-Abadi arrives in Mosul to announce its liberation and congratulate the armed forces and Iraqi people on this victory,” notes a description of the photo. The fight left large parts of the city in ruins and killed thousands of people while forcing the displacement of almost 1 million people. France and Britain quickly congratulated Iraqi forces for the victory. “Mosul liberated from ISIS: France pays homage to all those, who alongside our troops, contributed to this victory,” French President Emmanuel Macron wrote on Twitter. Mosul holds particular significance to ISIS, because it was seized in the summer of 2014, when the group’s leader, Abu Bakr al-Baghdadi formally declared a caliphate. “The loss of Mosul means ISIS is no longer the same, for better or worse. It’s no longer the quasi-state that it projected itself to be. But everything achieved against the group is fragile. The ideology is still there, the appeal is still there, and so are the divisions that helped them take power,” said Hassan Hassan, a resident fellow at the Tahrir Institute for Middle East Policy. Iraq launched its operation to retake Mosul in October, with the help of airstrikes from the U.S.–led coalition. That coalition has also been providing advisers to aid the effort. Hanging over the declaration of victory is the reality of the hard road ahead. The security forces in Mosul still face dangers, including ISIS sleeper cells and suicide bombers. And they must clear houses rigged with explosive booby traps so civilians can return and services can be restored. Nor is the broader fight over: Other cities and towns in Iraq remain under the militants’ control. The United Nations says it could take at least $1 billion to rebuild Mosul’s basic infrastructure. Meanwhile, the threat from ISIS is also far from over, as the group may launch new terror tactics. “The militants will go underground and they may well look to make hit-and-run attacks in classic guerrilla style—in Mosul and many other places,” writes the BBC’s Alan Johnston.